Searching allows you to view, browse and create reports from your data. You can perform searches by either entering the queries in the main search entry or by using the Query Builder to create the queries for you. The results of Bauble searches are listed in the main window. Three are three types of search strategies available in Bauble. Considering the search stragety types available in Bauble, sorted in increasing complexity: you can search by value, expression or query. Searching by query, the most complex and powerful, is assisted by the Query Builder, described below. All searches are case insensitive so searching for Maxillaria and maxillaria will return the same results. Search by value is the simplest way to search. You just type in a string and see what matches. Which fields/columns are search for your string depends on how the different plugins are configured. For example, by default the PlantPlugin search the family name, the genus name, the species and infraspecific species names, vernacular names and geography. So if you want to search in the notes field of any of these types then searching by value is not the search you’re looking for. Search string are separated by spaces. For example if you enter the search string Block 10 then Bauble will search for the strings Block and 10 and return all the results that match either of these strings. If you want to search for Block 10 as a while string then you should quote the string like "Block 10". Searching with expression gives you a little more control over what you are searching for. It can narrow the search down to a specific domain. Expression consist of a domain, an operator and a value. For example the search: gen=Maxillaria would return all the genera that match the name Maxillaria. In this case the domain is gen, the operator is = and the value is Maxillaria. The search string gen like max% would return all the genera whose names start with “Max”. In this case the domain again is gen, the operator is like, which allows for “fuzzy” searching and the value is max%. The percent sign is used as a wild card so if you search for max% then it search for all value that start with max. If you search for %max it searches for all values that end in max. The string %max%a would search for all value that contain max and end in a. For more information about the different search domain and their short-hand aliases, see search-domains . If expression are invalid they are usually used as search by value searchs. For example the search string gen= will execute a search by value for the string gen and the search string gen like will search for the string gen and the string like. Queries allow the most control over searching. With queries you can search across relations, specific columns and join search using boolean operators like AND and OR. plant where accession.species.genus.family=Fabaceae and location.site="Block 10"
This query would return all the plants whose family are Fabaceae and are located in Block 10. Searching with queries usually requires some knowledge of the Bauble internals and database table layouts. The following are the common search domain and the columns they search by default. The default columns are used when searching by value and expression. The queries do not use the default columns. The Query Builder helps you build complex search queries through a point and click interface. 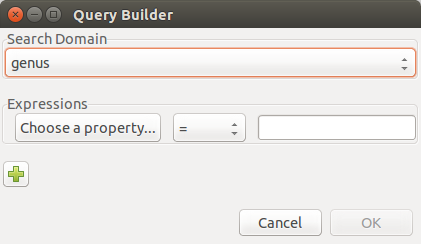 To open the Query Builder click the to the left of the search entry or select Tools‣Query Builder from the menu. The Query Builder composes a query that will be understood by the Query Search Strategy described above. You can use the Query Builder to get a feeling of correct queries before you start typing them by hand, something that you might prefer if you are a fast typer. 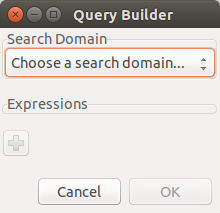 After opening the Query Builder you must select a search domain. The search domain will determine the type of data that is returned and the properties that you can search. The search domain is similar to a table in the database and the properties would be the columns on the table. Often the table/domain and properties/columns are the same but not always. Once a search domain is selected you can then select a property of the domain to compare values to. The search operator can then be changed for how you want to make the search comparison. Finally you must enter a value to compare to the search property. If the search property you have selected can only have specific values then a list of possible values will be provided for you to choose from. If multiple search properties are necessary then clicking on the plus sign will add more search properties. Select And/Or next to the property name choose how the properties will be combined in the search query. When you are done building your query click OK to perform the search.